If individual travel days needed to be summed up using a single word, my third day in Paris would be described as Macabre. I started my morning off with a brisk, but purposeful stroll through the Montparnasse Cemetery. I confess, I rather enjoy visiting historic cemeteries. 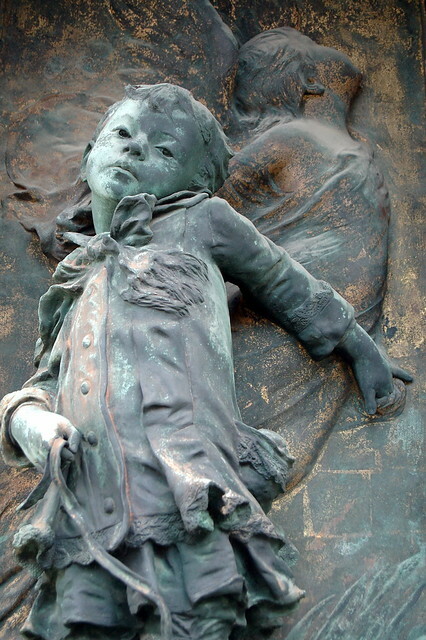 I experience a macabre delight when gazing at the creepy faces of the statues guarding the mausoleums or when reading the more unusual names listed on the tombstones. I even keep a list of names I like: Verity Noble. Gastone de Montague. Desire Perineaux. Ida Mae Butterfield. Victoire Hope Wintingue. This morning, however, I was on a mission that involved more than the reconaissance of unsual names. 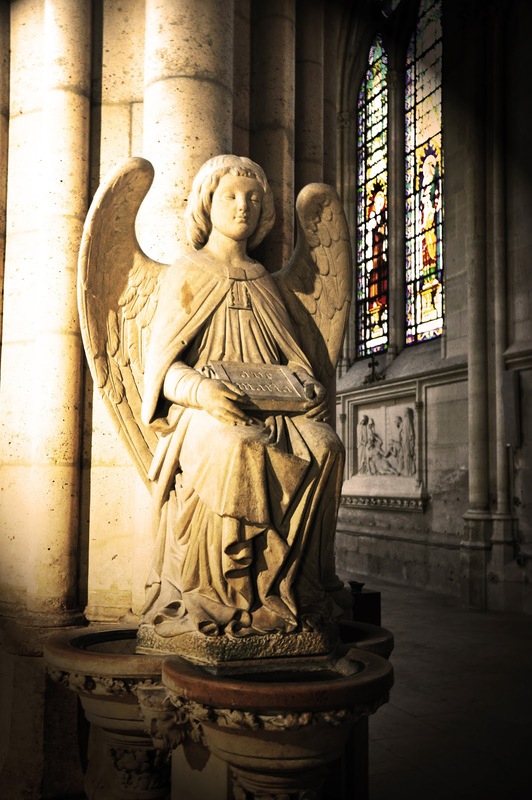 Built in the early 19th century, Montparnasse has become the eternal resting place for some of France's most intellectually and artistically gifted souls. On this early autumn morning, I was looking for the grave of the French author, Guy de Maupassant. Maupassant, considered by many to be one of the fathers of the modern short story, wrote haunting, unsettling, brilliantly tales of horror and romance. 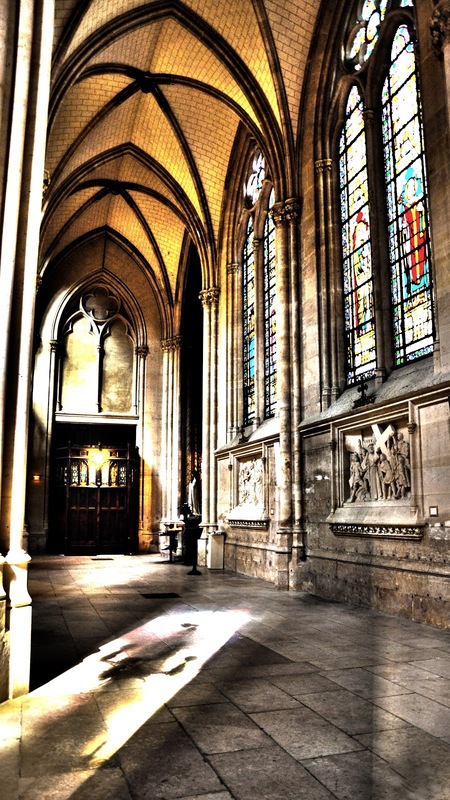 Armed with a map, I marched up and down the crowded aisles looking for Maupassant's grave. I am not sure what I expected to find - inspiration, perhaps - but I was unprepared for the shabby, sad little tombstone, easily overlooked, and surrounded by a low, rusted iron fence. Staring at Maupassant's neglected plot, I wondered what he would think if he could look down from his celestial perch. I imagined him in Heaven, bent over a golden desk, his silver-tipped quill scratching across a scroll of parchment as he plotted his next delightfully morbid tale. He pauses and squints, peering into the clouds below his feet at that ragged little plot of earth that serves as the resting place for his mortal hull. Perhaps for the first time since slipping his earthly bonds, Guy de Maupassant feels himself to be an insignificant, bit player in the grand production called Life. It made me think about my own passing. If the world had forgotten about a writer as gifted as Guy de Maupassant, what would happen to my memory when I passed? Would anyone visit my grave, place flowers on my tombstone, pluck the errant weeds from my humble plot? I stood in the empty cemetery, listening to the mournful toll of a distant church bell, and thought about those I have loved and lost - those few souls that time and space have conspired to steal from me. And I realized that we did not need grand mausoleums or elaborately carved statues to be remembered. On that morning, standing over Guy de Maupassant's neglected grave, I paid tribute to him in a way far greater than any bouquet of flowers. The same way I pay tribute to those I love but can no longer be with...by remembering their beauty and the important roles they played in my life - in making me feel loved and wonderful. I closed my eyes and said a silent prayer for those lost to me. I told them how much I missed them. How much I still love them. The breeze shifted and, for a moment, I thought I heard a whisper in my ear - a faint ghostly reply - "I love you, too." I exited the cemetery through tall, lacquered green metal doors and made my way to 1 Avenue du Colonel Henri Rol-Tanguy, Place Denfert Rochereau where I joined a veritable army of tourists standing in line to visit The Catacombs. I will be honest, my energy and spirits were lagging. My neck still hurt from the tortuous plane ride to Paris (a cruel reminder of my own reluctant march toward decrepitude). It was hot. I felt sticky and irritable. And the European tourists standing in line in front of us, puffing on acrid cigarettes, were sawing on my last nerve. 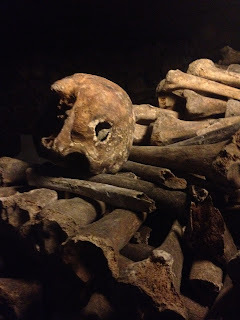 Despite my many trips to Paris, this was my first visit to her underground ossuary. Feeling hot, achy, and annoyed, I began to question my decision to visit another moldering repository of human bones. What morbid curiosity had inspired me to make this my Day of Death? The line persistently inched forward, the tourists extinguished their cigs, my muscle relaxer kicked in, and soon I found myself in a dank, dark labyrinth of tunnels located deep beneath the streets of Paris. The history of the Catacombs is really quite fascinating. In the late 1700s, after Les Innocents, a cemetery located near the market Les Halles, became perilously over-crowded with moldering corpses, the king ordered them exhumed and relocated to a tunnel deep below the city streets. The king wanted the citizens of Paris to have a healthier living environment and the corpses to be moved somewhere out of the way so they could spend perpetuity in a dignified manner. Not everyone shared the king's views on the sanctity of the strange resting place. Louis XVI's impetuous little brother, the Comte d'Artois, held booze-saturated orgies in the Catacombs. Today, visitors can see graffiti etched into the walls, left by irreverent citizens during the French Revolution. I couldn't help but wonder which of the neatly-stacked skulls had been victims of Madame Guillotine. It was strangely thrilling to be surrounded by the bones of people who had lived and loved during The Terror. Had one of them been a friend of my beloved Marie Antoinette? Was the neanderthal-sized skull that of a gardener who had once toiled in the soils surrounding Versailles? I stood in the subterranean corridor and looked at the piles of bones stacked up on either side of me like Lincoln Logs. Who were these people? What were their stories? What legacies did they leave? There are approximately six million people interred in the Catacombs, most of their names have been forgotten. I thought of Guy de Maupassant and his shabby little grave. I should have felt melancholy over my own mortality, but I did not. I felt invigorated. Visiting Montparnasse and the Catacombs reminded me to continue living my life with joy, wonder, appreciation and vigor. After all, this is not a dress rehearsal. It is the grand production called Life. In my opinion, sharing a delicious meal with charming, witty companions is one of the greatest pleasures in life. After spending the morning rubbing elbows with the corpses of those long-forgotten, I was eager to rejoin the land of the living. Crêperie Josselin, a quaint but bustling eatery located at 67 Rue du Montparnasse proved the perfect place to revive ourselves. Stéphanie, my friend and travel companion, arranged for her Parisian uncle to meet us at the crêperie. I had heard stories about this much-beloved relative - about his library crammed with books from floor to ceiling, his passion for history, his great intellect - and was eager to meet him. I was also a trifle nervous. When Stéphanie first described her uncle, I began forming a mental portrait of him that closely resembled Sir Laurence Olivier. I saw a tall, lithe man with a thin moustache, winged eyebrows, and a cool, intelligent gaze. I imagined him wearing custom-made pinstriped suits ordered from Savile Row and carrying a leather-bound, first edition of Stendhal's Le Rouge et le Noir. I confess, I worried he might find my French as atrocious and wanting as my knowledge of Stendhal. Fortunately, the man who greeted us with a warm hug and kisses on the cheeks was nothing like the intimidating, stuffy mental portrait I had envisioned. Brimming with bonhomie, he ordered us a bottle of Breton apple cidre and welcomed me to Paris. We spent an enjoyable lunch dining on Breton crêpes and debating who was the greatest king to have ruled France (He prefers Henri IV, while I prefer François I). He told us about his efforts to restore a historic mill located on his summer property on the island of Corsica. The conversation flowed as easily as the cidre, and soon I felt the warm glow of contentment - the kind of contentment one feels when they are experiencing a perfect moment. For lunch, I had a savory buckwheat crêpe with ham, eggs, and cheese. 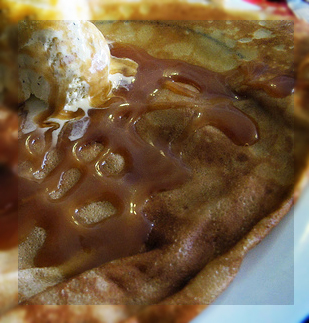 For dessert, Stéphanie and I split a salted caramel crêpe, filled with vanilla ice cream and swimming in the most delicious salted caramel sauce. 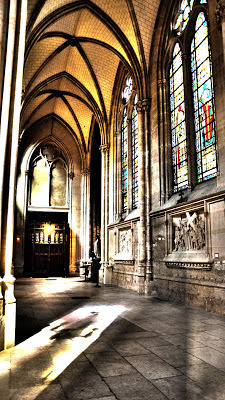 Serendipity soon led us to the St-Gervais-et-St-Protais Church. 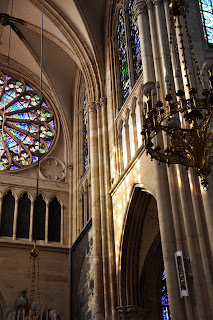 Begun in the sixth century and completed in 1657, this Gothic church houses the oldest organ in Paris and has some of the most amazing stained glass windows. We arrived to find the church nearly empty. 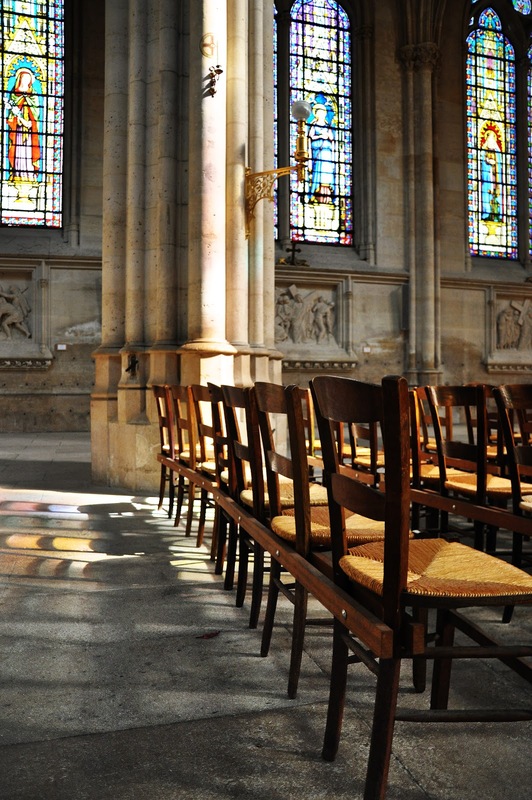 A small cluster of nuns were praying in a front vestibule. 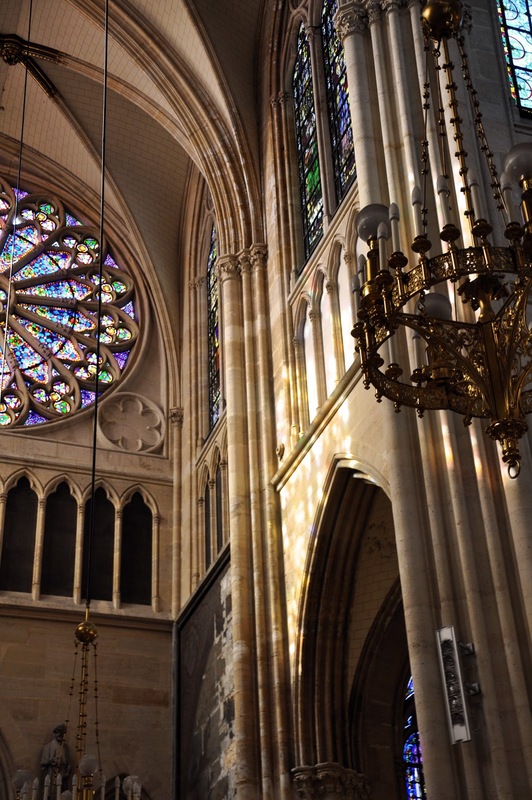 Bathed in an arc of amber light, the holy sisters knelt beneath a masterpiece of a stained-glass window. They painted the picture of piety and serenity. I stood in the shadows, watching their profiles, their heads bent, their lips moving in silent prayer. I longed to snap a photograph of them, but did not. 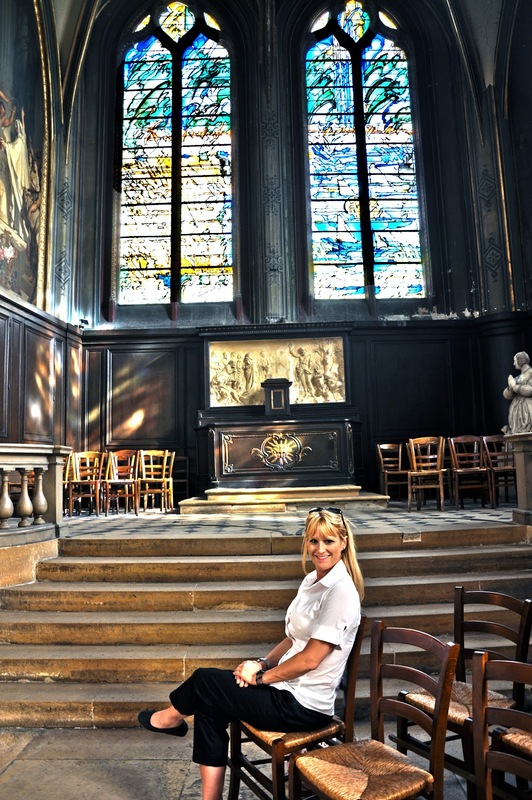 Instead, I sat on one of the rush-seated chairs and offered up a prayer of thanks for the quiet church, the nuns, and this second, perfect Paris moment. 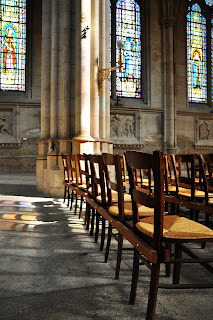 I moved about the sanctuary, inhaling the comforting aroma of incense commingled with beeswax, and snapping pictures. 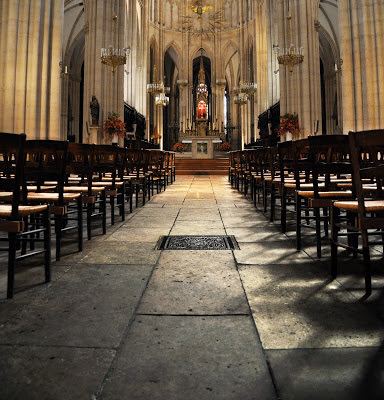 The empty nave of St. Gervais-St. Protais in Paris. When I say Paris, what comes to mind? The Eiffel Tower lit up at night like a giant Christmas tree? Quiet, sun-dappled jardins? 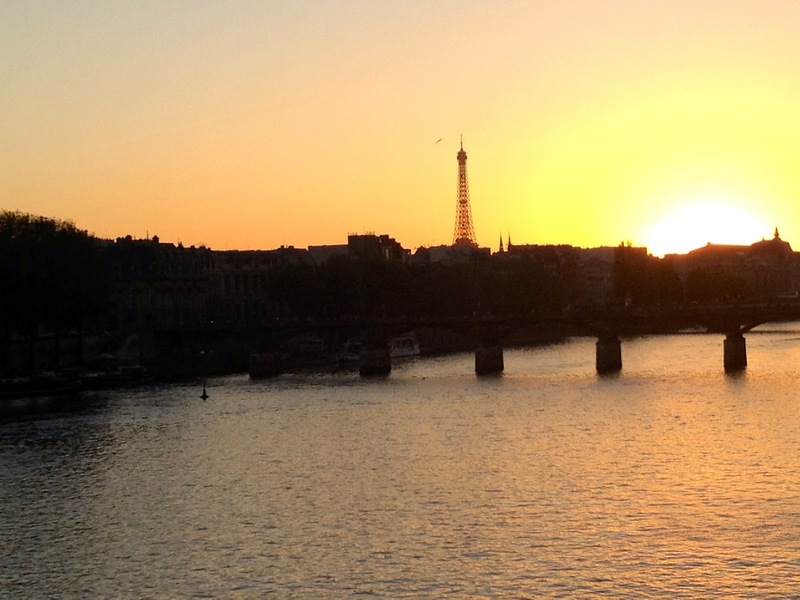 A romantic stroll along the Seine? You probably don't think of serial killers, vampires, cannibals, regicidal maniacs, booze-fueled orgies, and a mentally unbalanced queen who climbs to the top of a tower to screech and howl at the moon. Paris might be beautiful but she has a lot of dirty little secrets. Her closets are full of skeletons. While planning our trip, I came across a link to the Ghosts, Mysteries, and Legends Night Walking Tour offered by Viator. 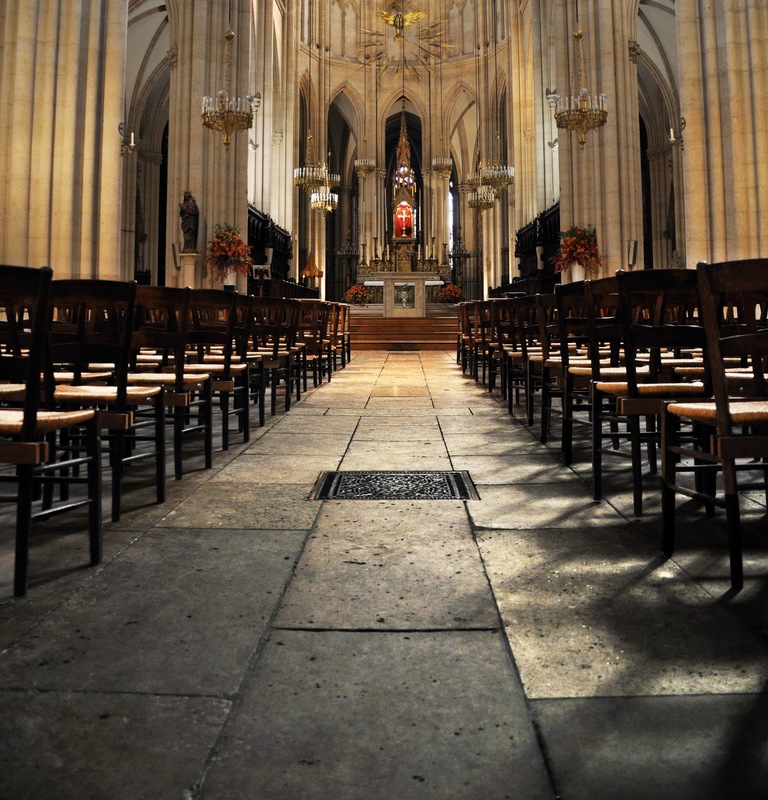 Viator's website promised the tour would take me "off the beaten path, down tucked away streets," where some of the most heinous crimes and acts against human nature have taken place. It said tourists would learn "little-known facts about some of the most famous sites in Paris." 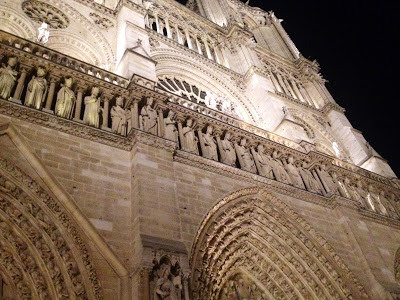 Two hours of ghost tales, history, walking, and Paris? Sign me up! Being French, Stéphanie is skeptical about the paranormal. The unseen world of gossamer ghosts, bellowing banshees, and forsaken fantomes seems too fantastic for her practical mind. Still, she thought the tour sounded as if it might be "interesting" and so I bought us each a ticket. 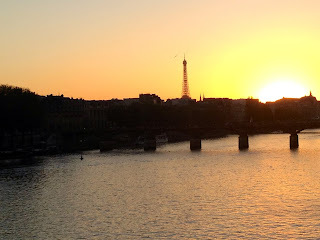 As the sun plunged deeper into the Seine, Stéphanie and I stood on the Pont Neuf, in the shadow of the statue of Henri IV, and waited for our tour to begin. Our guide, a lovely, slender Irish young woman named Shonna, pointed at the statue of Henri IV and told us to "remember that face, for you shall soon hear the gruesome details about his demise" and walk on the spot in which he drew his final, agonized breath. Shonna led us down a set of stairs to a spot between a grassy lawn and the bridge. 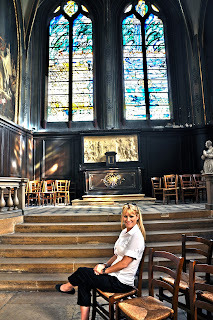 Then, in a somber tone, she informed us we were standing on "sacred ground" - the very spot where, on Friday 13, 1307, Jacques de Molay and a band of his Templar Knights were burned at the stake. Shonna shared several gruesome details about the event and the surrounding area before urging us back up the stairs and across the bridge. She led us to La Samaritaine. For those of you who are unfamiliar with La Samaritaine, it was once an upscale department store like Harrods in London or Saks Fifth Avenue in New York. Housed in a grand, Art Deco building that took up an entire city block, it catered to the rich and famous. The store closed in 2005 because of financial difficulties. Today, thick metal shutters seal off all windows and doors, giving the abandoned department store a tomb-like quality. Shonna informed us that a legion of homeless drug addicts and vampira have claimed the decrepit building as their own. These warped people of the night enter and exit the building by navigating their way through the catacombs beneath the city. I confess, I felt a chill trickle down my spine when I heard that I had spent my morning traipsing through subterranean tunnels frequented by blood-sucking Parisians. Our tour continued to La Fontaine de la Croix du Trahoir, Square of the Innocents, Les Halles, The Rat Trap Shop (as seen in the movie Ratatouille), the Conciergerie, the Palais du Justice, Hotel Dieu, and Notre Dame de Paris. Shonna was an fantastic tour guide. She was well-informed, friendly, funny - and gracious when I pointed out an error she made in the telling of Marie Antoinette's final days at the Conciergerie. The unique tour was the perfect ending to my Macabre Day in Paris. After the Gloaming by Leah Marie Brown - A haunting tale about a banshee included in the anthology, The Mammoth Book of Scottish Romance. Ghosthunter: A Journey through Haunted France by Simon Marsden - Fabulous photographs and stories about haunted sites in France. Spirited Away by Cindy Miles - A ghostly romance about a band of knights cursed to roam Dreadmoor Castle. I have always wondered if any paranormal activity has been reported at Versailles. Have you ever heard any stories? Leah my pal! What a fantastic blog and superb journey! Thank you for sharing!!!! I'm anxious for more ghost hunting adventures with you! Leah, thank you for sharing your fantastic journey! What fun!!! I'm looking forward to more ghost hunting adventures with you, my pal! Thank you for visiting my blog. Forgive me for taking so long to respond. You might also enjoy my other blog, dedicated to Marie Antoinette: Titillating Tidbits About the Life and Times of Marie Antoinette. This so awesome love reading about what you seen and found in Paris. Yes I often wondered if the dead can watch us cause I sure have some tales myself about it. Well can’t wait till you next adventure and if you need a partner to go well I am your girl lol. Thank you for sharing this my friend I love it.